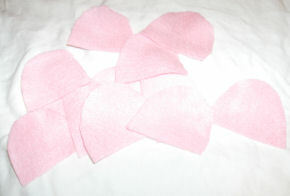 First: You cut your felt into cute little “U” shapes, above right. For a really full flower, cut about 15 pieces. I cut five larger and three smaller pieces. 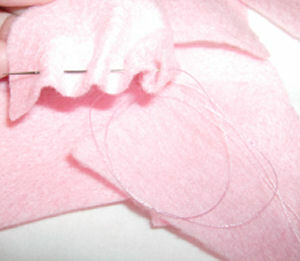 Second: You take your needle and thread and slowly gather the flat end of the “U” shaped piece (not the curved end) as shown, left. 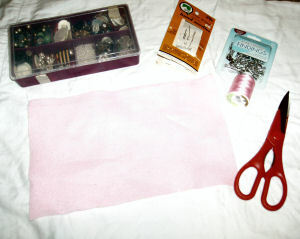 You will want to continue and sew all of your pieces like the photo at left. 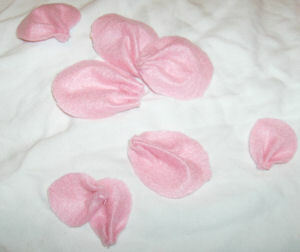 Once sewn together, they will look like these pretty little petals, below. Third: After you have finished gathering all pieces with your thread, you will want to sew all of those pieces together to form a flower shape, one petal at a time, above. I sew the larger pieces together first and the smaller pieces last. Fourth: Once all pieces are sewn together, you will add either beads or buttons on top as shown, left. You can use sea beads or any type of beads you like. I used three red beads that look like jelly beans. 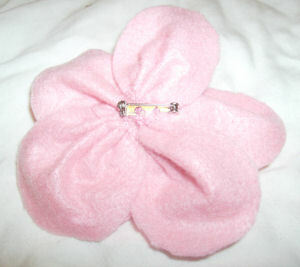 Fifth: Once you’ve sewn your beads onto the front of the flower, you will take your ¾” bar pin and sew that on the back, as shown above right. 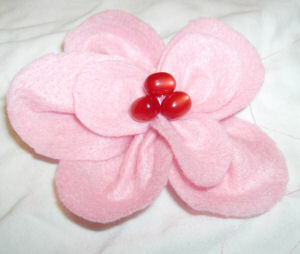 WaLa: You have a really pretty felt-flower brooch. This can be worn a combination of ways: on a jacket or a skirt waistband. I purchased a vintage silk belt at an estate sale that was pretty plain and added this cute lil’ brooch to the front of it to jazz it up a bit! 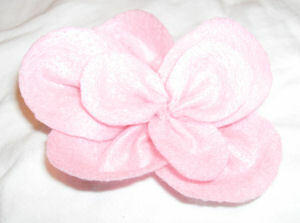 This item and others can be found at: MattieReidChicago.com.